Cyclone Idai, which left behind a trail of devastation across Southern Africa, could be a blessing in disguise for South Africa's army, the region's most dependable peace-keeper, which could be facing a crisis due to budget problems. The issue is the topic of a lead article in Tuesday's Mail and Guardian, after it took South Africa's Air Force up to a week to pull together the resources it needed to launch a rescue operation in nearby Mozambique, Malawi and Zimbabwe, where Cyclone Idai killed 700 people and left hundreds of thousands homeless. 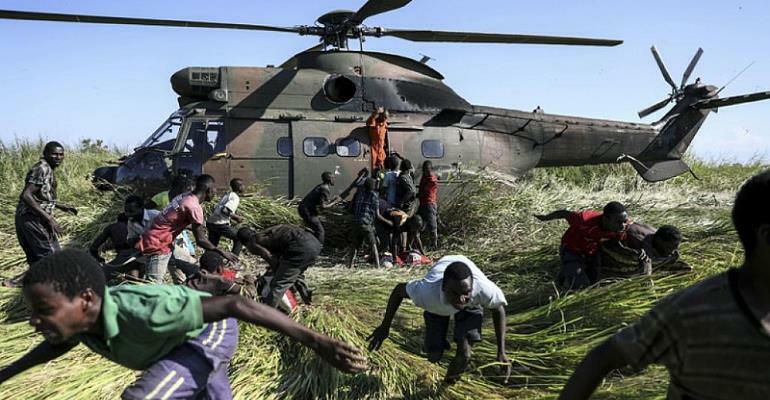 Mail and Guardian reports that Pretoria managed to get six helicopters across the border, rescuing 14,000 people from trees and rooftops where they sought refuge from massive floods. Sipho Kings, a senior correspondent with the Johannesburg-based Mail and Guardian and author of an incisive piece about the critical state of decline of the South African defence forces, says that despite its commendable action in dealing with one of the worst natural disasters to hit southern Africa, the SANDF had never found itself in such a financial squeeze. According to Mail and Guardian the South African National Defence Force spends 57 million euros on its peacekeepers in the Democratic Republic of Congo despite the UN's coverage of operational costs. Sipho Kings told RFI the government's decision in 2016, to slash R10 billion over three years from the military's resources, meant that South Africa is now spending less than 1% of its budget on defence. This fiscal year, he explains, the department received R50 billion to operate everything, including the purchase of new equipment, maintenance and arresting the decline in critical defence capabilities. That is on top of continuing peace support operations and safeguarding South Africa's territorial integrity. Kings says that a plan drawn up in 2015 calling for the doubling every year of the Defence budget has remained in the drawers. King adds that South African decision makers are under more pressure to put money in competing interests, such as education and healthcare.